Today, hours before International Translator’s Day finishes everywhere in the world, I’d like to write down some personal thoughts about this profession that I am so in love with. 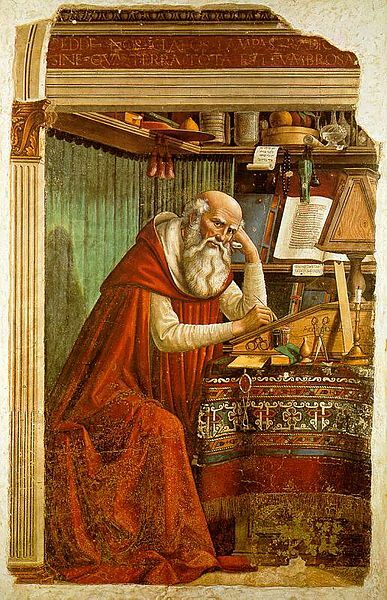 I like to think of Saint Jerome translating the Bible into Latin because he wanted to bring knowledge to the people. And yes, I know this may or may not be true, as it was Pope Damasus I who commissioned this huge job, but I like to think of Jerome as the essence of what, in my opinion, translation stands for: a bridge between knowledge and people. Saint Jerome translated the Bible from Hebrew and spent the rest of his life justifying his choices by means of translation commentaries. As a translator, does that sound familiar to you? I mean, look at him! Doesn’t he look a little bit frustrated? I can even imagine him being stuck in particular pun. This cool guy went as far as moving to Jerusalem to sharpen his Hebrew in order to translate from the source, rather than rewrite and compile all the passages which had already been translated into Latin by several different people. Pretty much an overseas experience, I’d say. It meant moving into a different country to be surrounded by the language he was translating from, in order to understand it better. As a translator, does that sound familiar as well? All I’m saying is that translation theories have changed and been reshaped along the years, but, deep down, I consider every translator as a part of the same group, the same tribe, the same people. A curious, perfectionist people, always eager to learn about others and the way they do life. Surely we will learn new, better ways in the process, right? Ultimately, this is the reason why I do what I do: people everywhere need to be able to access knowledge, disregarding the language that this knowledge was expressed in. What other way are we going to improve as a race? A multiplicity of voices. Dialogue is the only way.